I love this time of year when you start to see fresh berries at the supermarket. Especially strawberries! While it is not quite summer yet (and not even really spring in Newfoundland 🙁 ), I’ve decided I can no longer hold out on sharing summer desserts. So I’m starting today and declaring this Almond Butter Strawberry Shortcake Tart with Coconut Cream the first dessert of my summer baking season! This tart is quick, delicious and, you guessed it, clean! It’s dairy free too, which is an added bonus 🙂 ! First, let’s start with the amazing almond butter cookie crust which is the base of this tart. It’s pretty much the same as the cookie crust I used in these Peanut Butter and Chia Jam Cookie Cups, except I used almond butter instead of peanut butter. I love how this crust stays chewy but gets crispy around the edges. And it bakes up super quick. We are talking 5 minutes to assemble and 10 minutes in the oven! Done! The filling is pretty simple, and that’s what is so great about this Almond Butter Strawberry Shortcake Tart. I used chopped fresh strawberries but you could also use blueberries, blackberries and/or raspberries. The red berries and coconut cream would make a pretty awesome looking Canada Day dessert! Or throw some blueberries in there too and make it a Memorial Day or 4th of July dessert! (BTW, Happy Memorial Day to those readers in the US!). As the summer goes on, you can substitute other seasonal fruits in this dessert. I think fresh cherries or peaches would be amazing! In addition to the fruit, I sometimes drizzle a little bit of honey on top of the fruit before I add the coconut cream. This is optional and depends on how sweet you like your dessert! If you haven’t noticed from my other recipes, I am obsessed with coconut cream. It is so delicious, and so easy to make. Just refrigerate a can of full fat coconut milk, scoop the solidified coconut milk off the top and whip it up in an electric mixer. (I’ve been testing out different brands, and I think the Thai Kitchen full fat coconut milk is the best so far). You can add different sweeteners or flavours to the cream. For these Flourless Ricotta Cupcakes I made a chocolate coconut cream, so I added cocoa powder and maple syrup. For this Almond Butter Strawberry Shortcake Tart, I used some maple syrup, but I also added cinnamon and almond extract. 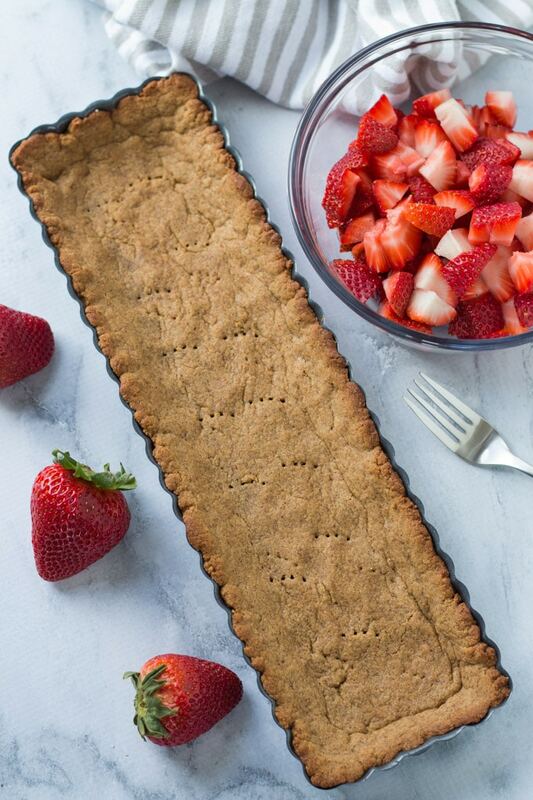 It tastes fresh and creamy and the hint of cinnamon and almond pairs nicely with the strawberries and the almond butter cookie crust. Yum! In addition to the coconut cream, I also topped this tart with toasted coconut. I think it makes it look more like a shortcake, and let’s face it, desserts are better with coconut sprinkled on top 🙂 . You could say I have an obsession with all things coconut! Another example would be this Coconut Carrot Bundt Cake. Yum! 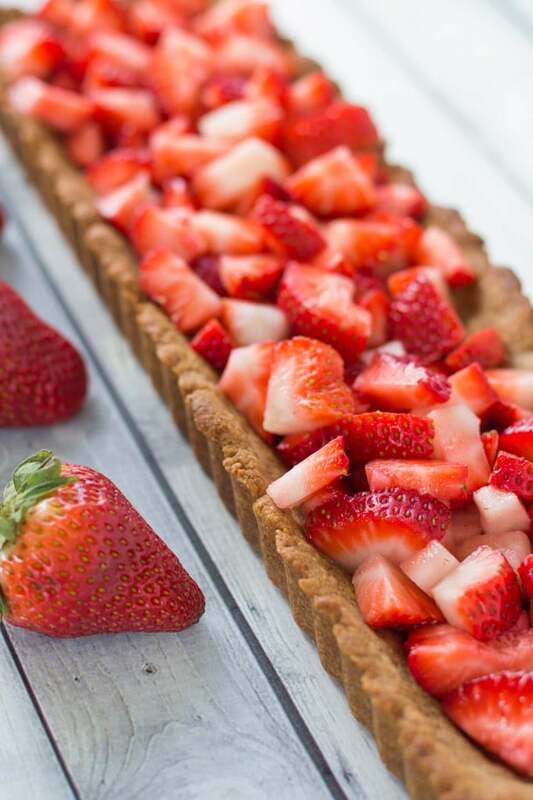 This Almond Butter Strawberry Shortcake Tart is a perfect summer dessert and a great addition to a pot luck or BBQ gathering. It is not overly sweet or heavy, so it’s a nice light dessert to finish off a big meal. I know, in the summer heat, no-bake desserts are ideal. But this crust can be made ahead of time and it only takes 10 minutes to bake. So your oven is barely on really 😉 ! 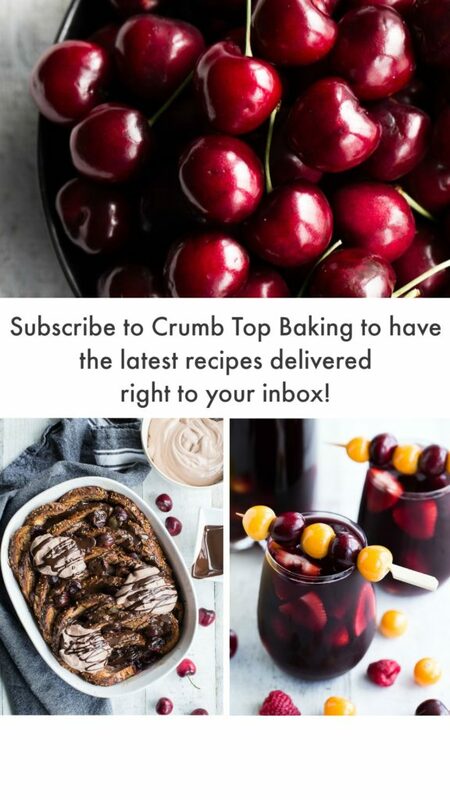 I will definitely be sharing other fruit/berry/coconut cream type recipes for the summer, so if you enjoy this combo, keep an eye on the blog and let me know what else you would like to see! And, as usual, if you make this dessert for any of your upcoming BBQs or summer gatherings, let me know how it goes in the comments below! Strawberry shortcake that’s clean eating? Yes please! 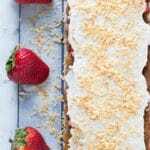 This Almond Butter Strawberry Shortcake Tart with Coconut Cream is light, tasty and dairy free. 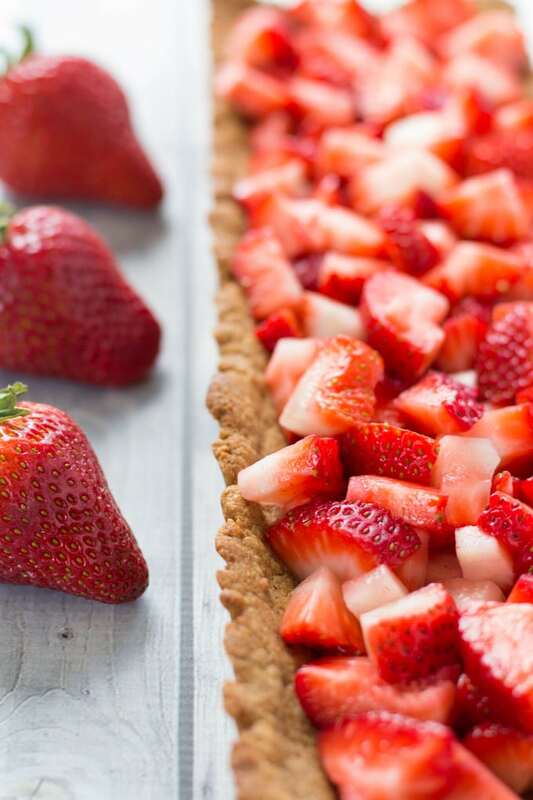 With ingredients like almond butter, whole wheat flour, egg whites, strawberries and coconut cream, this tart is the perfect “good for you” summer dessert. Plus, it’s quick and easy. Yay! Pre-heat the oven to 375 degrees and grease a tart pan with cooking spray. (I used a 14′ x 4′ tart pan). Beat together the almond butter, coconut oil and honey with an electric mixer on high speed until well combined (approximately 3-5 minutes). Add the sugar and beat on high for another 30 seconds. Finally, add the egg whites and beat on medium speed until well combined and creamy. Remember to scrape down the sides of the mixing bowl as you go. Gradually add the dry mixture to the wet mixture and beat on low speed until combined, about one minute. The mixture will be crumbly. Press the mixture into the greased tart pan, making sure to shape the crust around the sides of the pan. Poke small holes in the bottom of the crust with a fork to prevent the crust from puffing up too much. Place the crust in the pre-heated oven and bake for 5 minutes. The tart will puff up a bit. Remove from the oven and carefully press down the crust with a teaspoon in order to maintain the shape. Poke additional fork holes in the crust if necessary. Place the crust back in the oven and bake for another 5 minutes until the edges of the crust are browned. (Do not over bake as the crust will continue to firm up once removed from the oven). Remove the crust from the oven and cool completely on a wire rack. 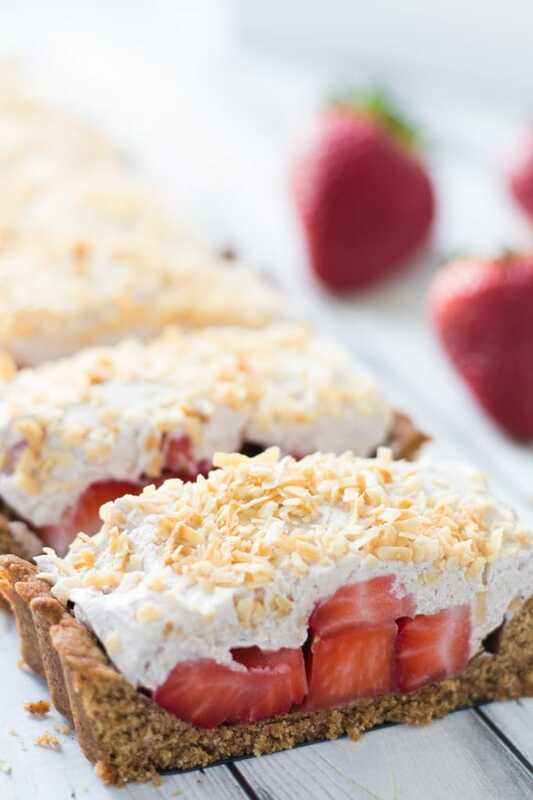 While the crust is cooling, chop the strawberries and prepare the coconut cream. To prepare the cream, refrigerate the can of coconut milk overnight. Scoop the solidified coconut cream off the top and add to a bowl along with the maple syrup, cinnamon and almond extract. Beat on high with an electric mixer for 3-5 minutes, or until the coconut cream is smooth. 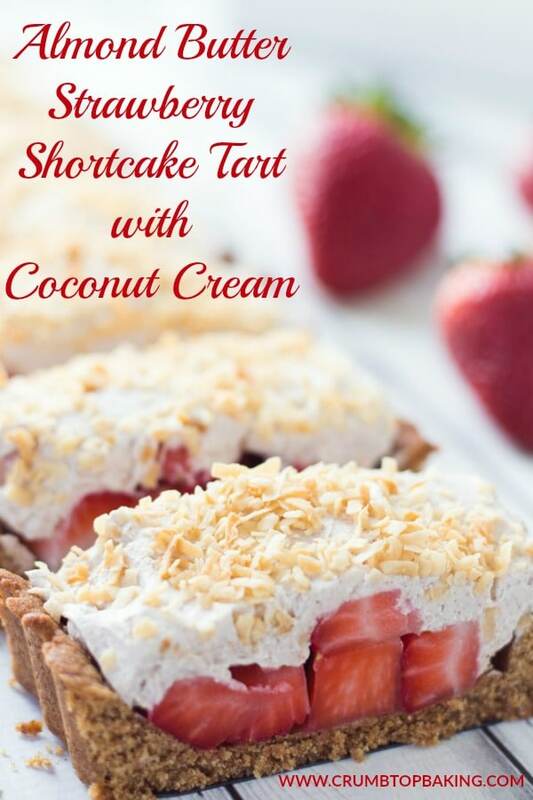 Add the strawberries to the cooled crust, then spread the coconut cream on top and sprinkle with coconut. Store leftovers covered in the fridge and enjoy within 2 days! You can also make individual cookie crusts by baking the dough in muffin pans. This recipe will make 6 regular muffins or 12 mini muffins. Remember to reduce the baking time accordingly. I wouldn’t make this dessert a day in advance of your gathering. I suggest waiting to whip up the coconut cream and assembling the dessert until you are almost ready to serve it. This way the coconut cream will be at its freshest. this sounds like the perfect combo between decadence and health! 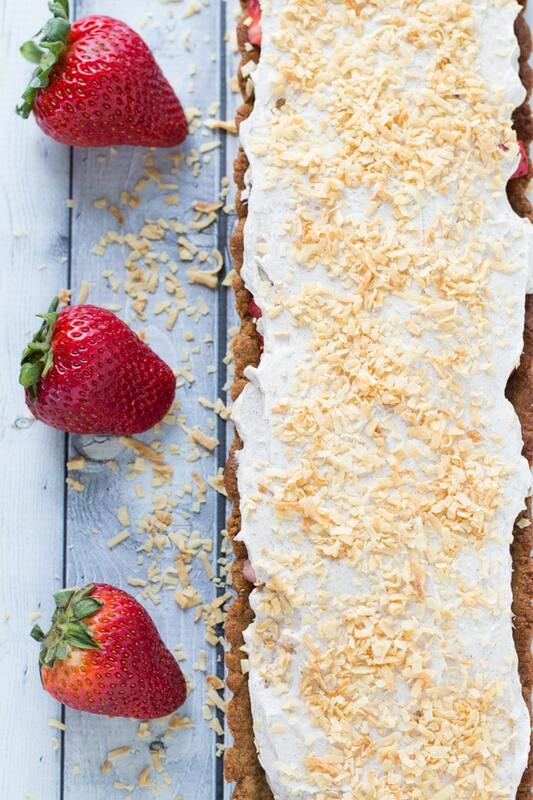 the strawberries and almond butter make this one healthy, right (; and love all the coconut! Thanks Heather! Totally agree. This one has lots of clean eating ingredients, but is a nice treat too! Strawberry season is my absolute favourite. My first job at 14 was picking strawberries and I’ll eat them anyway – even just with milk in the morning for breakfast. Sounds like a pretty great first job! I love a bowl of strawberries with almond milk and a sprinkle of granola! Pinned! I can hardly wait til it is patio dinner time! I love that you can make it ahead! Thanks Carolyn! I hope you like it! And yes, being able to make it ahead is definitely a bonus! Wait…I can eat this guilt-free? I think you’re my hero. I want to make this right now… I just might! It looks so good and right up my alley! I have a big container of organic strawberries in the fridge screaming my name! Thanks Gabby! This dessert is definitely a great way to use up fresh strawberries! Let me know what you think if you make it! This is such a delicious spring time tart! I absolutely love desserts with fresh strawberry, so this is right up my alley.